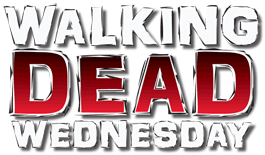 Walking Dead Wednesday is in accordance with prophecy. Last year, we said that most of Maggie's surviving family was made into Mystery Minis, but not her sister Beth because Beth was kind of insufferable until a later season. Well here we are, with toys based on that later season, and look who's getting a toy! Whiny Beth disappeared before the end of Season 4, when Daryl lost her to a mysterious black car with a white cross painted in the back window. She reappeared in the middle of Season 5, having been dragged back to Atlanta against her will. 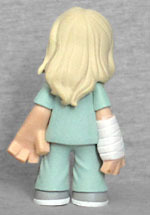 Beth is dressed in hospital scrubs. They've been sculpted with lots of wrinkles, but then painted with even more - all thin teal lines. 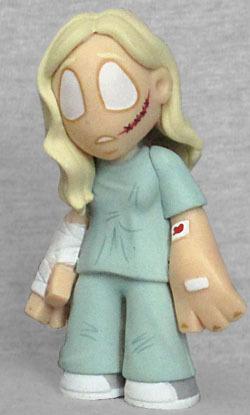 We can tell that this figure represents Beth when she first woke up in the hospital, because while her arm is in a cast, there's a bloody IV port on her left elbow, and there are sculpted(!) stitches on her cheek, she doesn't have a black eye or the stitches on her forehead. The bandages are all sculpted elements, which is pretty impressive, and her hair falls over her right shoulder very naturally. Beth is one of the rarer figures in this series, available in a 1:36 ratio. Fortunately, thanks to funko_layout, I was able to get her first try.